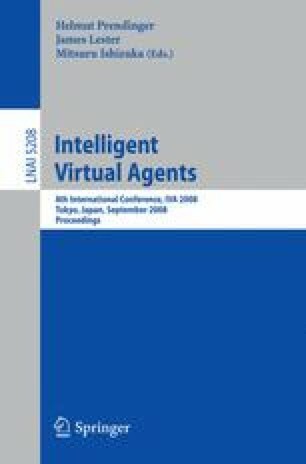 In the human computer interaction (HCI) literature, responding socially to virtual humans means that people exhibit behavioral responses to virtual humans as if they are humans. Based partly on the work of Nass and his colleagues (for a review, see ), there is general agreement in the research community that people do respond socially to virtual humans. What seems to be vital, in terms of understanding why people respond socially to virtual humans, is how we respond socially to another person and how we know about others’ temporary states (e.g., emotions, intentions) and enduring dispositions (e.g., beliefs, abilities).